Casa de Nariño, Bogotá, Colombia. Wikimedia Commons. All Rights Reserved. 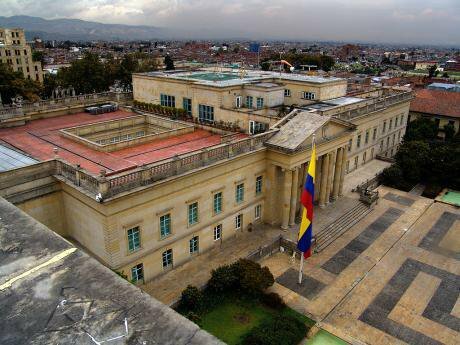 On June 17th, presidential elections for the period 2018-2022 were held in Colombia. The extreme right-wing candidate Ivan Duque, supported by former president Alvaro Uribe, obtained 10,373,080 votes (equivalent to 53,98%). In this second round, Duque ran against the ‘Human Colombia’ proposal, represented by Gustavo Petro, who won the support of 8,034,189 voters (41,81%) expecting a transformation in the way in which the country has been ruled until now. This election will have consequences in different areas, which were already becoming apparent before the new president officially took power on August 7th. In the first place, the worrying trend towards growing numbers of assassinations of social leaders and territorial defenders has shot up exponentially. This growth trend began in 2016, after the cease fire and the signing of the Havana Agreement between the Colombian government and the former Colombian Revolutionary Armed Forces (FARC, by its acronym in Spanish; now known as the political party Common Alternative Force). In July 2018, seven peasants were assassinated in the village of Argelia, Cauca, a region where peasant and ethnic (indigenous and afro-descendant) movements have organized to defend their territories from foreign investments and against armed conflict. Between January and June 2018, 123 activists were assassinated in Colombia. In relation to the peace process with the FARC, the elected president has made public his intention to substantially reform some elements of the agreement, mainly those related to the Special Jurisdiction for Peace. In relation to the peace process with the FARC, the elected president has made public his intention to substantially reform some elements of the agreement, mainly those related to the Special Jurisdiction for Peace (JEP, by its acronym in Spanish). Days before the Argelia massacre, the Congress of the Republic ruled on how the JEP should function, approving deep changes proposed by the Democratic Centre (Duque’s party). Those changes impose limitations on the assessment and judging of National Army members and changes in the agreements around extradition cases. In this sense, the possibilities for integral justice are reduced. Integral justice refers to processes of prosecutions, reparations, and reconciliation which also have the power to take on State crimes and which, relatedly, can contribute to broader social processes of reconstructing memory and truth in the wake of conflict and human rights violations. Crucially, these processes must usually include, for example, confessions by the public forces, revealing their motivations and connections. However, beyond the dissapointing outlook inspired by the extreme right-wing victory, it is important to bring up here a series of possibilities which have emerged as a result of the years of public debate before and after the electoral confrontation of 2018. It is vital to begin by indicating the importance of the eight million votes that supported an alternative proposal, which placed itself outside the liberal-conservative bi-party tradition that, in its multiple expressions, has ruled the country since its constitution as a Republic in 1819. This was the first time that a political proposal approached this level of popular support without buying ballots, or relying on armed pressure or other fraudulent or clientelist strategies. This is a milestone, indicating the beginning of a new era in the struggle for governmental power, in popular power building and, ultimately, in the exercise of politics. This new period wouldn’t be possible without the foregoing process of social and popular movement building and strengthening that has been developed over decades, but especially since the appearance of the Social Indigenous and Communitarian Minga in 2005, as an expression of popular organizing processes to reclaim rights and defend territories. It is also necessary to mention the weapons turned in by the former FARC rebel group. These two processes have broadened the possibilities for consolidating articulations among social organizations and movements, have allowed the participation in politics of historically invisibilized sectors and, as a consequence, have created opportunities for the re-organizing of forces in the popular field. - In the recent elections, diverse social movements and organizations decided to support and build the Human Colombia proposal from the local level, leaving aside political and ideological differences in a bid for strategic unity at the electoral conjuncture in 2018. - The mass turning in of weapons by the FARC insurgency changed some of the terms of the electoral and political debate. For years, and especially since 2002 elections (when Alvaro Uribe was elected president in his first mandate), the majority of the country’s problems have been presented as a result of the armed confrontation with the FARC. - Historically the corrupt dominant forces have used the war as an excuse to grab territories and violate rights, and have made a profitable business out of these practices.In the 2018 electoral process, an important part of the Colombian population saw the real origin of this political practice. For the first time, topics such as corruption, land concentration, and systematic violence by right-wing political and armed actors were at the core of the public debate. - Manipulations of issues in the Havana peace agreement and substantial modifications to the JEP, which risk continuing the peace process. - The return of forced eradication of so-called illicit use cultivation through aerial glyphosate spraying. - The impossibility of continued negotiation with the National Liberation Army (ELN by its acronym in Spanish). This negotiation seems to be vanishing with the conditions proposed by the elected president. - The economic and foreign investment agenda includes a tax reform, reducing taxes for the business sector and redefining territorial ones. - The continuity and deepening of territorial exploitation through the mining-energy and agro-industrial model, opening doors for fracking. In sum, the announcements by the new president make explicit an agenda that rules in favour of transnational capital and against popular sectors, both in the cities and in the countryside. In light of these threats to the rights of the Colombian population, it is critical to imagine how the eight million votes for ¨Human Colombia,” as a rejection of traditional politics, can effectively become a social and political organizational. Facing a national government controlled by the extreme right wing, resistance movements must consolidate local powers and find the breaks in the antidemocratic model at the territorial level. One initial proposal is to aim for governmental power at the local and regional level, especially in those provinces (departamentos) and municipalities where Human Colombia won the majority of the votes. Facing a national government controlled by the extreme right wing, resistance movements must consolidate local powers and find the breaks in the antidemocratic model at the territorial level. In order to do this, it is critical to debate some of Gustavo Petro’s proposals, which are not shared by popular movements and organizations. For example, the idea of agro-industry as the core of economic development is opposed to peasant agriculture as the axis of production and organization in rural areas. In the same vein, the proposal to commodify nature as an alternative to the mining-energy model is infeasible from the radical environmentalist perspective, since this is just one more mechanism to strengthen corporate control of territories, whilst green washing. Besides the necessary debates on the Human Colombia proposal, the current conjuncture demands, in order to sustain the social and political articulations around the existing agreements, that movements move towards a debate based on popular participation and, at the same time, to avoid new dispersions and divisions that might negatively impact the delicate balance of forces achieved during the electoral exercise. In the face of the visible threats including the return of 'Uribismo' and its national and territorial power structures, democratic forces must reinforce and unite to coordinate actions defending life, and to strengthen the resistance that, in the Colombian context, is as significant as the extreme right-wing counter attack.